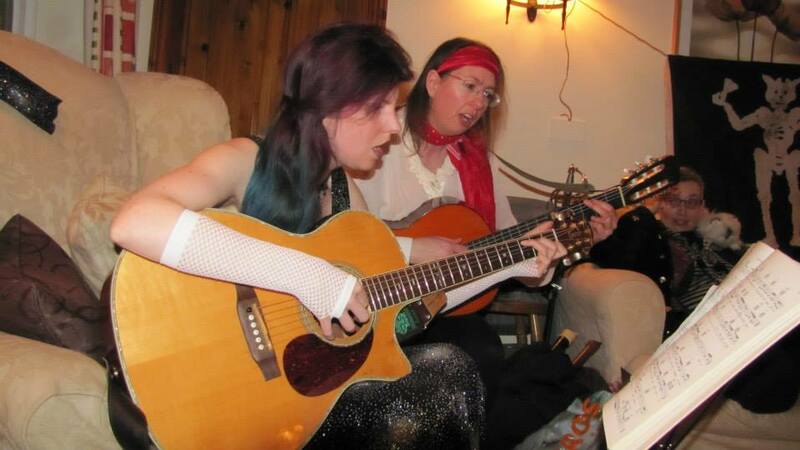 Formed in the summer of 2013, Freyja’s Fire began life as an esoteric pagan trio consisting of Carys, Carys’s ex partner (who no longer wishes his name to be mentioned) and Sophie; though since last November Carys and Sophie perform as a duo. Sophie started playing guitar at the age of nine, whistles as a teenager and melodeon at the age of 33. She sings with Trianon, an Ipswich-based choir; is one third of acapella folk trio “Triangle” and also plays and dances with several morris sides. Carys began singing around the time she began to form words and has been performing one way or another for most of her life, though these days is as likely to be found improvising vocals for electronic music as singing traditional folk. As a songwriter, she follows her own inspiration and claims the music is just waiting in her guitar to be enticed out. Together, they perform a mix of their own original songs, traditional tunes and covers from performers as diverse as Inkubus Sukkubus, Christy Moore and Steeleye Span, all on a pagan theme.